Last weekend the World Cup circuit moved to Szklarska Poreba, Poland for two days of sprint and distance racing. Australia’s regular World Cup athletes, Callum Watson and Esther Bottomley both competed. This World Cup weekend also saw Bottomley’s distance World Cup debut on the second day of racing in the 10km classic. Making her distance World Cup debut, Bottomley finished in 60th place in the women’s 10km classic event the next day. Not surprisingly, the podium was taken by a trio of Poland’s Kowalcyz and Norwegians Bjoergen and Johaug. Norway also rounded out the top 5. In the men’s 15km classic, Callum Watson placed 62nd from a field of 68, 4:45 minutes off the winner Johan Olsson of Sweden. Switzerland’s Dario Cologna and Russia’s Alexander Legkov rounded out the men’s podium. Watson’s result earned him a solid 98 FIS points. The Under 23 athletes are fully qualified, while the junior athletes will contest one event each. The next city sprint in the World Cup circuit was held in Moscow, Russia. 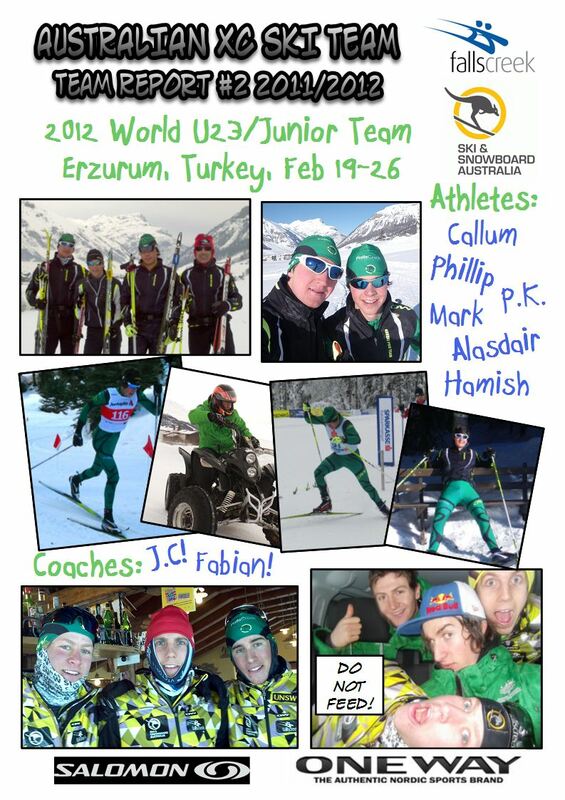 Three Australian athletes took part in the sprint- Esther Bottomley, Callum Watson and Mark Van der Ploeg. The conditions for the sprint were cold with cold, dry snow making times slower and the field spread out. Esther Bottomley finished 54th in the women’s time trial, with the final event being won by Poland’s Justyna Kowalcyz. Callum Watson and Mark Van der Ploeg finished 63rd and 64th respectively, equal to the bib numbers they wore on the start line. Teodor Peterson of Sweden was the men’s final winner. Callum Watson finished in 59th place, 5:43 minutes off the race winner Canadian Devon Kershaw. Mark Van der Ploeg was next in 60th. The team is currently completing an altitude training block in Livigno, Italy. Some of the athletes will then move to Erzurum, Turkey for the World Junior & Under 23 Championships. Catching up on the last few weeks of international racing action, during which Australian athletes have competed in the Estonian World Cup races at Otepaa and the Austrian Championships in Bad Ischl.